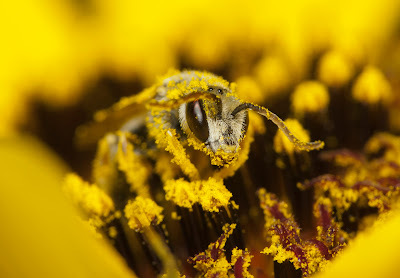 "We're interested in pulling pollen off of bees, sequencing that pollen, and figuring out what the bees have been eating," says Emory biologist Berry Brosi. "We can start to construct networks between plants and pollinator species." Pollen goes back about 491.2 million years, to the Devonian Period. Analysis of its traces have long been used to help solve mysteries related to the history of plants on Earth — from dating rocks for oil exploration to understanding the cultural practices of ancient peoples and investigating past habitats. Now pollen analysis is poised to play an increasing role in solving modern-day mysteries, aided by gene-sequence libraries and advances in DNA barcoding, or the use of DNA to identify species. DNA metabarcoding enables the analysis of multi-species samples, if those species are contained in a gene-sequence reference library. The Berry Brosi lab in Emory’s Department of Environmental Sciences recently expanded this gene-sequence library, adding a database for the rbcL gene to the already developed ITS2-gene library to improve the accuracy of plant species identification. While Brosi is focused on bee research, pollen analysis contains temporal and spatial signatures that have the long-range potential for a broad range of applications, including forensic investigations. Examples include pinpointing the origin of an illicit drug, testing whether the marketing labels on products such as honey and olive oil match their actual geographic provenance, and determining whether the body of a murder victim had been moved. The journal Applications in Plant Sciences published the work on the new rbcL library, and the database is publicly available. “We chose rcbL because the length of the gene is readily applied to modern high-throughput sequencing methods,” says Karen Bell, who led the work as an Emory post-doctoral fellow. The new rbcL library contains sequences from more than 38,400 plant species, adding to the ITS2 library of sequences from more than 72,000 species. After combining the two markers, the Brosi lab demonstrated that it could identify eight of nine plant species in a mixture, compared to only six species-level identifications based on ITS2 alone. If a plant species is not included in the reference library, however, it cannot be identified by DNA barcoding, so more sequences from the estimated 450,000 species of flowering plants must be added to make the pollen databases more comprehensive. The Botanical Society of America contributed to this report.